RPC-180 on initial recovery (note the significant amount of dust present). Containment Protocols: RPC-180 is to be securely contained at all times in a high-value item container marked #002-000971/J in sector J of Site-002. The container holding RPC-180 must be hermetically sealed and equipped with a climate control unit cooling the interiors to a temperature of 24oC with a dry atmosphere. Under no circumstances should maintaining personnel touch RPC-180's blade without glove protection. Exposed personnel (RPC-180-1) are to be detained immediately and screened for possible cognitohazards. Access to RPC-180's container requires a security clearance of Level 3 or higher. Personnel that has attempted and/or have successfully accessed RPC-180's container without proper clearance must be detained and taken to holding immediately. Description: RPC-180 is a Mandau1 with a wooden hilt and equipped with several ornamental engravings and 2 locks of horse manes. The scabbard for RPC-180 consists of the same wood used for the hilt and is equipped with bamboo ropes and an ornamental clamshell for the hip strap. The rusted blade of RPC-180. The blade of RPC-180 has been severely rusted due to neglect. Nevertheless, the rusted blades structural integrity is still sound and the edge is still very sharp. The individual atomic analysis of RPC-180's blade shows that it is made from a non-anomalous steel used in other instances of Mandau swords. The first anomalous property of RPC-180 manifests when a subject unsheathes RPC-180 with malicious intent. The subject's fingers that are holding the scabbard will spontaneously lacerate 2 seconds after RPC-180 has been unsheathed completely. Having glove protection will not prevent lacerations. The next anomalous property manifests when any subject (be it the wielding subject or the victim) touches the blade of RPC-180 with their exposed body parts. 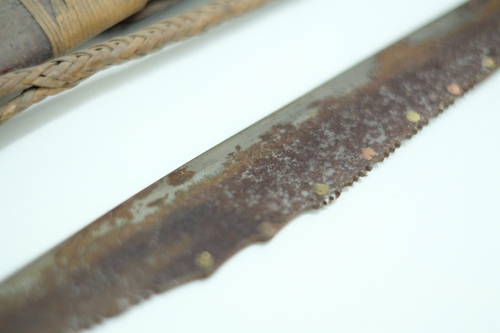 The body part that made contact with the blade will exhibit lacerations in spite of the part of the blade used. The wounds present on exposed subjects will not naturally seal themselves (given if the subject is healthy prior to exposure), much like an anti-coagulant effect found on leeches and mosquito bites. Regardless, the wounds can be healed with typical laceration treatments. The third anomalous property of RPC-180 manifests when a subject2 is within close proximity of RPC-180 for approximately 20-40 minutes. Instances of RPC-180-1 will be compelled to inspect and touch the blade with their exposed hands; giving them severe lacerations. Instances of RPC-180-1 will continue to touch the blade until either they expire due to blood loss or are removed from the vicinity. If instances of RPC-180-1 are removed from the vicinity of RPC-180 and held for 72 hours, they will state that they have no recollection of the event. RPC-180 was recovered from the attic of a house owned by █████ █████ ██████ ██████, located in Jl. Rambutan No. ██, Vorvo, Samarinda, East Kalimantan, Indonesia, dated ██/██/2003. RPC-180 caught Authority's after Mr. ██████—the former owner of RPC-180—notified the local authorities that his wife's hands were lacerated when she was going to clean RPC-180. Evidence of RPC-180 was eventually spread to the local media. MST X-Ray-6 "Annullifiers" were assigned to expunge said evidence and administer a Class-A amnestics to the local population. The recovery team successfully contained RPC-180 without event. 1. 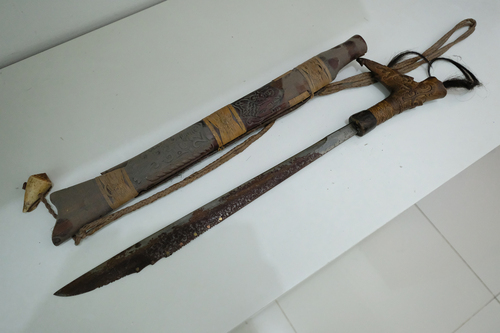 A traditional sword of the Dayak People of Borneo.